The garage can be used for much more than storing your vehicles. It can be a place where you can get various jobs done and store a wide variety of goods that are used for such chores. You can store tools and equipment here so they are secluded but quickly accessible when needed. As time goes by, you can start placing more and more goods into the garage so that they are safely out of the way, but over time it can become too much. You can fill your garage with a numerous types of items, such as tools, bikes, boxes, paint, Christmas decorations, old furniture, unused goods and much more, not even including your vehicle. If your garage in Brentford, TW8 has become too cluttered and you want an expert Brentford garage clearance done, contact Rubbish Removal Brentford on 020 3795 9570 today. Clearing a garage can be a lot of work. This is why we provide the best garage waste collection in TW8. We are firm who will help people to remove all the junk from their garage and ensure it is disposed of properly. Normally, this task will require a lot of time and effect, as you will have to sort, shift and transport the goods. We will handle every aspect of it though, so you can sit back and let us get on with the hard work. Our team can be called out to your address whenever it is convenient for you, with you selecting the time and date. We will deploy as many staff members as you need and they will have everything they need for the garage rubbish clearance. Our Brentford garage clearance services will be swift and safe. Our team are all professionals with the necessary skills and experience. When they arrive, they will learn more about the job, such as what you want removed, how to shift it, etc. They will go through your goods to ensure the garage junk collection goes well. They will break up larger items if they can and bag and box things for easier removal. They can carry objects of various sizes and weight without problem, and will do this without damage or injury. We have suitable vehicles that can fit in all the items we collect from your garage and then we will take everything to be disposed of correctly and legally. The garage rubbish disposal Brentford, TW8 we perform for you will adhere to our environmental policy. We work to produce the greenest results when helping you with a garage junk removal project. We will avoid using landfills or disposing of goods in a way that can harm the Earth, and instead focus on the green alternatives. 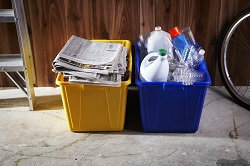 We will attempt to recycle as many goods as we can, so that they are made into new things or reused. We do all this extra work to benefit the environment and it will never cost you extra to get such support. To hear more about our green approach, call us anytime on 020 3795 9570. Call 020 3795 9570 today and we will provide you with a free quote. This no obligation required estimate allows you to select the services you need and customise the experience to your liking. Your garage clearance will be affordable, because you will see the price in advance and can pass on an offer and work on getting one more suitable for you. You never have to commit to a quote until you are satisfied. To find to more about Rubbish Removal Brentford and the TW8 garage shed clearance services we provide in Brentford, call our team now.